The 13th International Bonsai & Suiseki Meeting – Crespi Cup 2019 this year will take place in a unique week-end in Parabiago (MI), from 13th to 15th September, in the headquarter of Crespi Bonsai. Conceived in 1995 by Crespi Bonsai it has quickly become an event of great importance in Europe, thanks to the wealth of its contents, quality and organization. 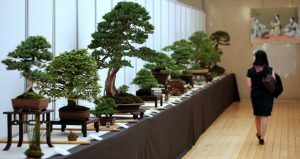 The high level of exhibitions that represent the world of bonsai, suiseki and pots and the participation of great characters and internationally renowned artists as mere amateurs made this event famous throughout the world. Thanks to unprecedented programs and internationally renowned artists, the International Meeting attracted attention of thousands of exhibitors and visitors from all continents. The thirteenth edition will host the usual five concourse exhibitions: Enthusiast’s Exhibition (amateurs’ bonsai trees), Crespi Bonsai Cup, Crespi Shohin Cup, Crespi Suiseki Cup and Crespi Pot Cup dedicated to collectors and professionals. The International Meeting will host bonsai, suiseki and pots of very important European collections, becoming in the bonsaist field as a reference point for all those who revolve around the fascinating world of trees and miniature stones. In addition to the prestigious cups, the show-competitions will altogether offer prizes for over 10,000.00 €.